She's a woman in action, moving out into the world with a mission. The light of Christ illuminates her path. Her arms lift joyfully, inviting others in a call to action. The olive branch draped across her chest urges us to carry on Christ's reconciliation in the world. ECW glows in the Christ light. 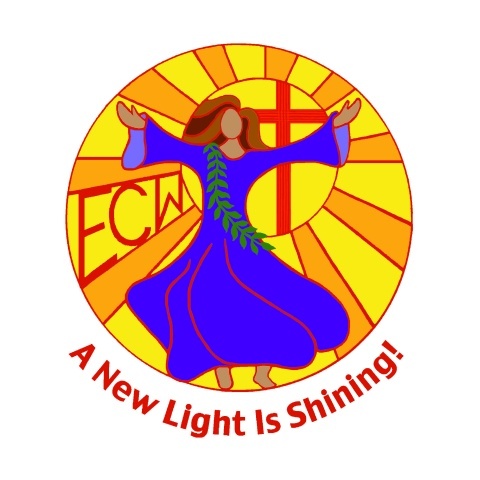 Color version of the ECW Triennial Logo designed for the 2003 national meeting of the Episcopal Church Women in Minneapolis, MN. This design is also available in jewelry form. See next pages and H54 in Symbol Jewelry. Nancy extends the gift to all Episcopal Church Women to use this logo in their ECW ministries with the exception of using it on items for sale w/out my permission. No one has the right to reproduce it in jewelry form. It is in use as a logo in many dioceses. I will be happy to send quality artwork images for such use upon request.